Hohe Dirn shall become a "Dark Sky Park"! For a long time, the Hohe Dirn was an insider's tip among Austria's best astronomical observation sites. Now, the natural-dark nightsky above the DIRN Observatory shall be permanently protected against light pollution and so be handed over to the coming generations in all it's uniqueness. DIRN Observatory strongly supports the Upper Austrian government's efforts to get the area around the Hohe Dirn certified as a "Dark Sky Park" by the INTERNATIONAL DARK-SKY ASSOCIATION (ida)! At September 24th and 25th, 2018 the Oberösterreichische Umweltkonferenz (Upper Austrian Environmental Congress) took place in Linz (Upper Austria). Conference topics were Light Pollution and artificial light in public space. Top-class speakers from Austria and Germany as well as experts and political decision-makers gave lectures on the conference topics looked at from the perspectives of Astronomy, Medical Science and Health, Ecology, Biology, Landscape Protection, Lighting Engeneerin and Education. Additionally an outstanding Video Licht im Einklang mit Mensch und Natur was shown for the first time. The worldwide intensity of light pollution. Only dark colored regiones still have naturally dark nights. DIRN Observatory in Upper Austria is located at such a rare place. Starting with the 21st century the use of artificial light in public areas in austria as well as worldwide is is rapidly growing. As a result of that fact a progressive brightening of the night sky brings manifold problematic impacts on man and environment. Exuberant artificial illumination "pollutes" the natural darkness by unnecessary and harmfull emissions and represents a special kind of environmental pollution. Yet, for people living in rural environments, it is quite normal to look up to the sky and to see thousands of stars. Not a matter of course in our days, as cities and conurbations show, where the number of visible stars is reduced to few dozens. A most recently published high-carat report - The new world atlas of artificial night sky brightness proves, that about 60% of all Austrians never have seen the milky way! In other words, for two of three of our children a sky littered with stars is not more than hypothetic - unreachable as a country far away! The reason is a new form of environmental pollution, a subject of dicussion since few years only but now developing a rapidly growing explosive nature: Light Pollution. This term summarises the illumination of natural night landscapes by artificial sources of light. In Europe the ammount of emitted artificial light grows by ten to twenty percent - per year! The effects of this "light smog" on man, nature and environment are substantial - mostly even severe. This is about no less than the "loss of night" that is already completed in most densely populated areas and now threatens the rural regiones - often caused by a simple lack of information of the emitters of light. A dark and unpolluted night sky is a value for you or your company? You want to preserve your fellow beeing's health? You want to protect the nocturnal fauna and flora? Then join the Save the Night Initiative! Reduce and optimize the night lighting of your building(s) or company site - swicth off light, whenever it is not really needed! 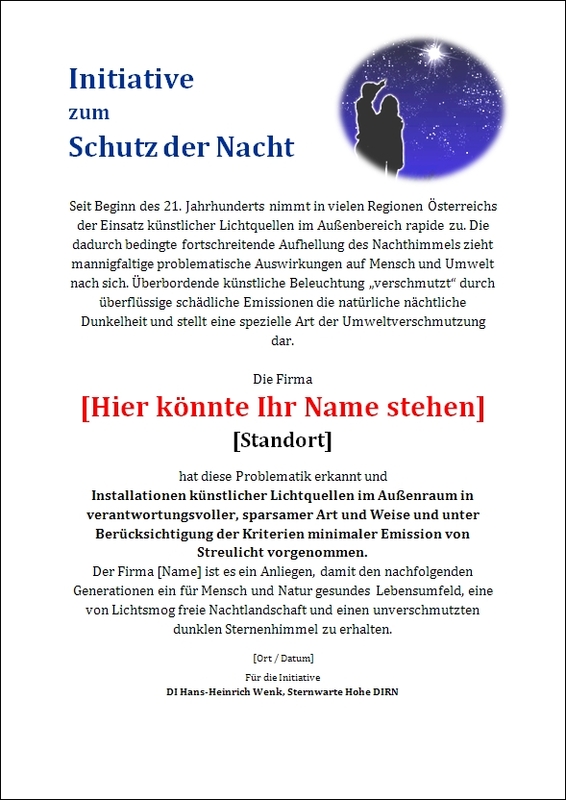 >>> Weber-Hydraulik (Losenstein, Upper Austria) is part of the initiative already! Contact me - I will advise you! Substantial reductions of scattered light will be rewarded with a certificate!